Each developed site has a water hydrant and electrical pedestal to accommodate 20, 30, and 50 amp trailers each with water, electric, picnic table and fire pit. Primitive sites have water nearby. There is a dump station for your use. 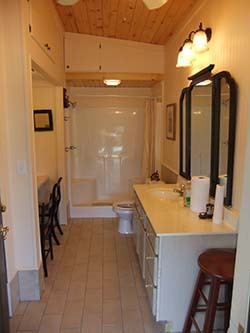 For You: Enclosed gathering/eating area, with pot bellied wood stove, gas grill, microwave and coffee pot. The lounge area has a big screen large TV, with a VHS/DVD player next to the men's & women's bathrooms with showers. 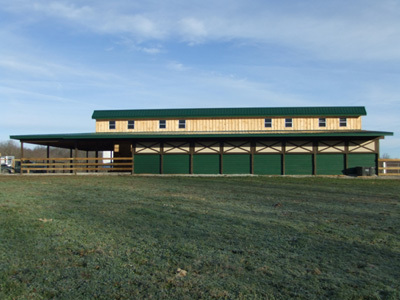 For your horses: Our main barn has a sun-lit 16' center-aisle with 14x14 bedded stalls, wash racks & round pen. The second barn has (4) 12x12 stalls, each letting out into two different fenced paddocks, with an adjoining tack/hay room & wash racks. To keep the grass we request that you only turn your house out for an hour after you arrive and one hour in the AM and PM. 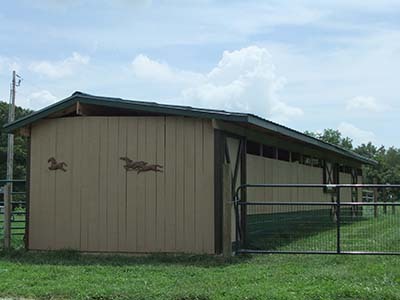 If your horse prefers to be out all the time we have a 200’x300’ paddock (#5) that is available. Sawdust bedding is free. Please clean stalls daily, or we will be happy to clean stalls while you are on the trail for a small fee. Please bring your own water/feed buckets and hay bags. We provide wheel barrows and composting manure area. There are two wash racks next to the barn, there is also hot water available inside the barn. WIFI in the near future.